When ESO Throws Its Mighty Shield! This week’s extra large episode of the Earth Station One Podcast is now available at http://www.esopodcast.com/. Join Earth Station One Episode 70 at http://www.esopodcast.com/. Earth Station One Episode 69 Now Available! Join Bobby and the ESO Crew for yet an episode of The Earth Station One Podcast we like to call: – Who would of thought a kid with a lightning bolt scar would change the world? It’s time to grab our wands and strike out and defend Hogwarts against the evil forces of he who shall not be named, when we talk about the final Harry Potter movie “Harry Potter and The Deathly Hallows”, but wait that’s not all we take a peek at the 2nd episode of Torchwood: Miracle Day. Also we will be talking to Vivana Chavez from the Walking Dead to help promote Fandom Fest this weekend in Louisville, KY.
Earth Station One Episode 69 is now available at http://www.esopodcast.com/. Bobby will be a guest at FandomFest in Louisville, KY this weekend, July 22 - 24. He'll have copies of his books on hand as well as doing panels. Please stop by the literary track and say hello. You can learn more about FandomFest at http://www.fandomfest.com/. Bobby’s panel schedule for the convention. You can learn more about FandomFest at http://www.fandomfest.com/. 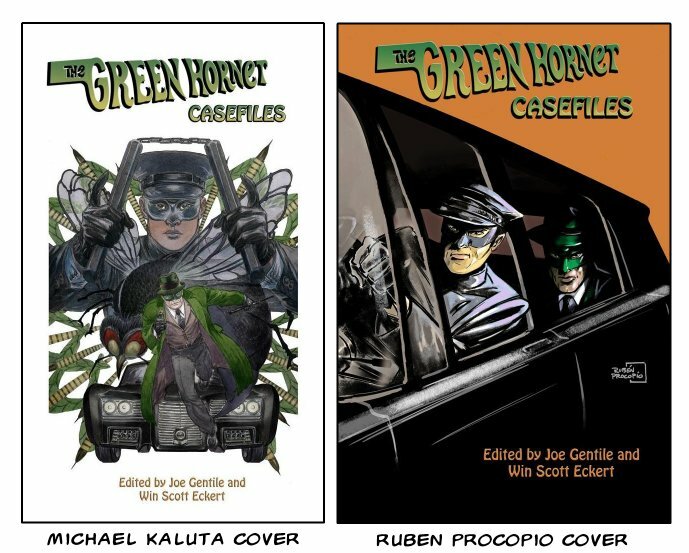 Over at his blog, Win Scott Eckert posted the cover to the recently announced third volume of Green Hornet stories based on the 60's TV series version of the characters. The new volume will be titled The Green Hornet: Still at Large! Says Win, "Yes, that's right, folks... there will be a third volume of short stories from Moonstone Books about the 1960s Green Hornet and Kato. Feast your eyes on the cover by Rubén Procopio!" "This time around, Joe Gentile and I will be joined by Matthew Baugh in sharing the editorial duties. Our lineup of writers is complete and they are getting busy. Look for the book some time in 2012!" Bobby will have a story in The Green Hornet: Still at Large called "The Gauntlet." Volume Two in the series, The Green Hornet Casefiles will be available August 2011 and features Bobby's story, "A Thing of Beauty." 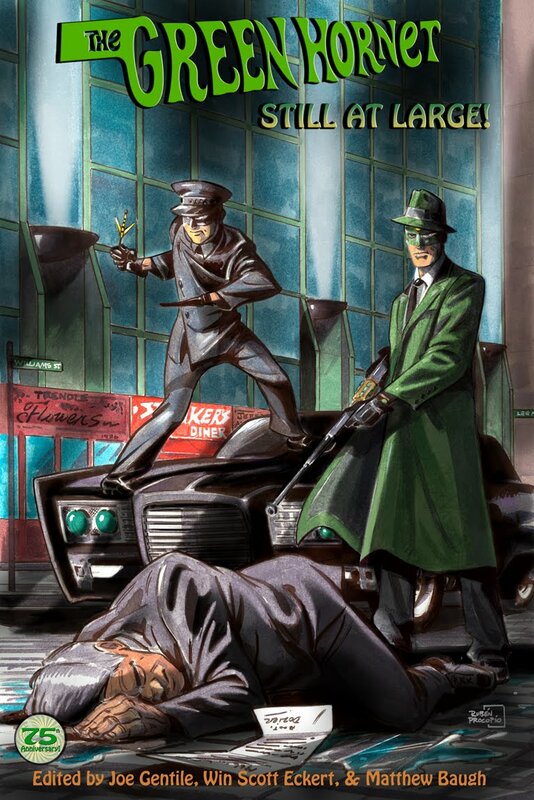 Green Hornet Casefiles coming very, very soon. Keep checking this space for more information we get it. 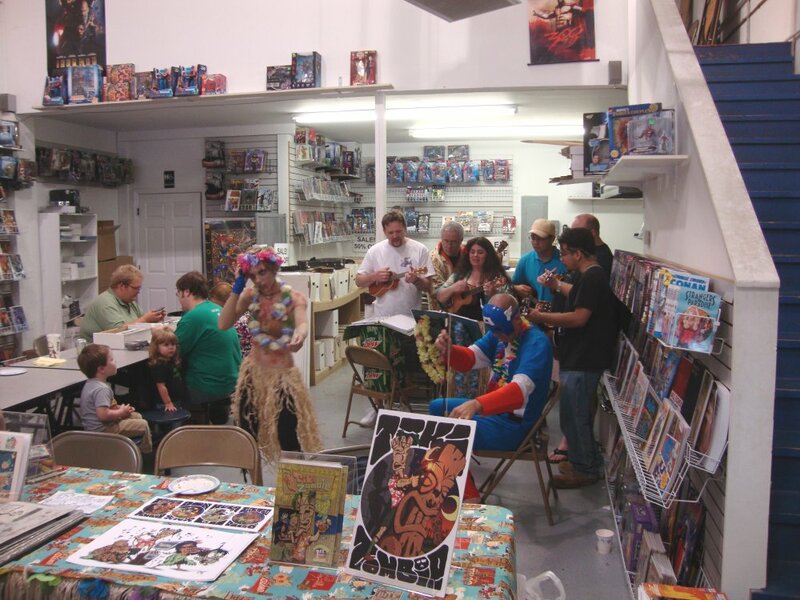 I attended the launch party for my friend, Mike Gordon's new comic book, Tiki Zombie at Galactic Quest Comics in Buford, GA yesterday. 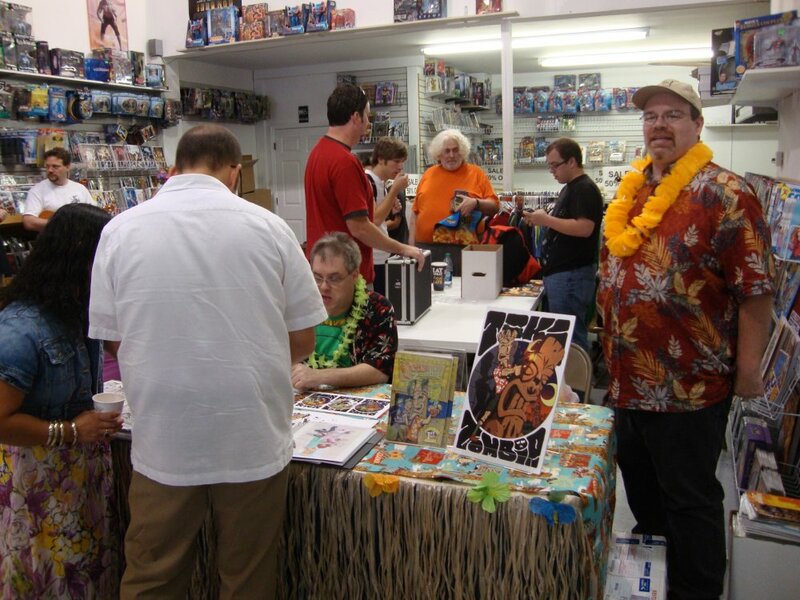 The creators of the book were on hand along with The Southeast Ukers, who brought their own dancing tiki zombie girl. It was a fun event for all ages and if you weren't there you missed out. It was definitely the most unique book launch I've attended. Kudos, Mike & Co. Here are a few photos. View video of The Southeast Ukers performance at http://www.youtube.com/seukers. You can learn more about the Tiki Zombie comic book at http://www.newlegendproductions.com/. The Southeast Ukers and their dancing tiki zombie. I'm gonna walk the Earth... like Kung Fu. Episode 68 of the Earth Station One marks Bobby's first episode as a fullfledged station crew member. 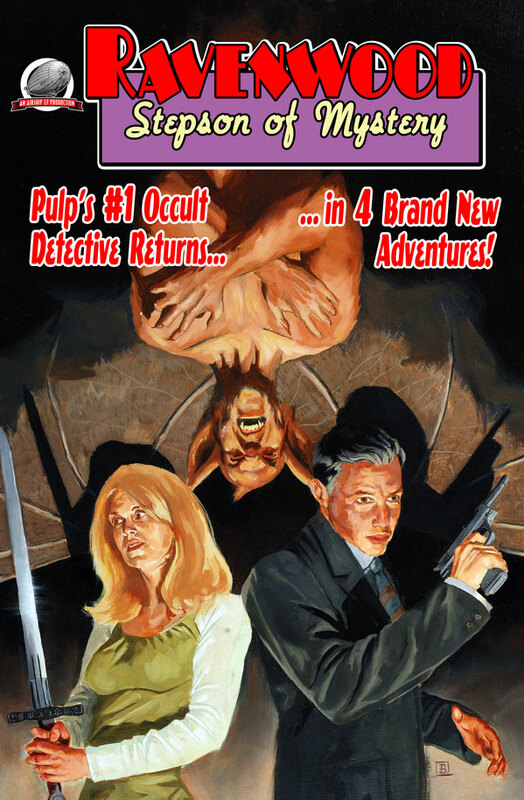 This week we're talking all things pulp including the movie Pulp Fiction, an interview with noted pulp writer Barry Reese, and we talk Fandom Fest with Writer Stephen Zimmer. You can listen to episode 68 at http://www.esopodcast.com/. 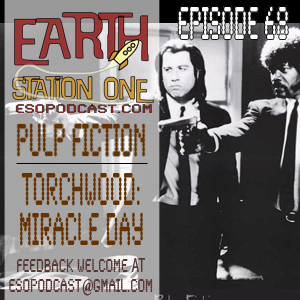 Welcome to yet another episode of The Earth Station One Podcast, this week we dive into all thing “ Pulp” from Pulp Writing to Pulp Fiction, and joining us to help discuss it is Pulp Writer Barry Reese, but wait that’s not all, we also review the first episode of Torchwood: Miracle Day. Domino Lady On The Beach. Pencils: Rock Baker. Inks/Tones: Jeff Austin. I saw the art from the upcoming Halloween Event, Return Of The Monsters Special Domino Lady Vs. Mummy today and let me just say that this is going to be one gorgeous book. In the spirit of our heroine, here's a tease of what's to come. 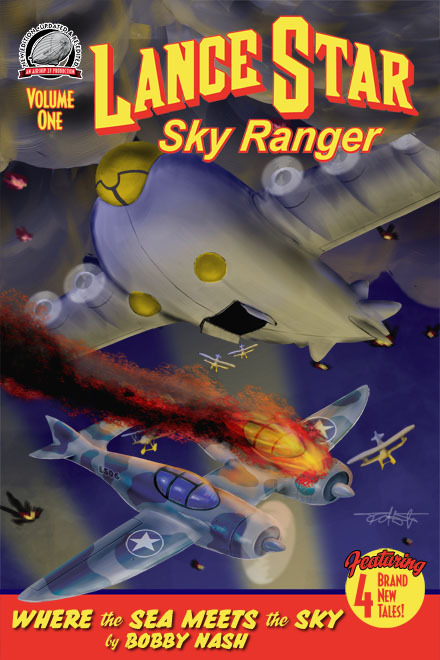 iPulp Fiction is releasing pulp tales featuring Lance Star: Sky Ranger. Bobby Nash’s story, “Where The Sea Meets The Sky” was released July 7th for the low price of $1.00 and is still available at http://www.ipulpfiction.com/. 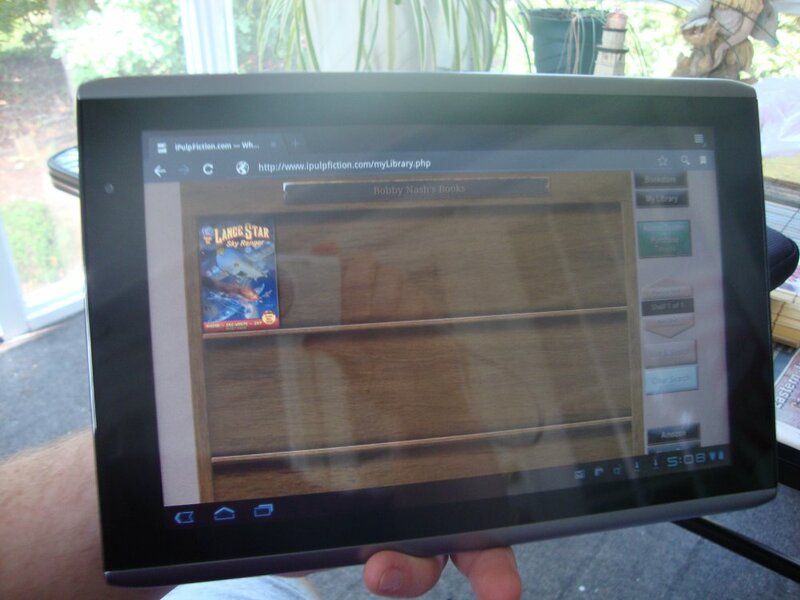 You can see in the photos how it looks on a tablet. In addition to the iPulp Editions, print and digital editions from Airship 27 are also available at http://www.gopulp.info/. Last Page. 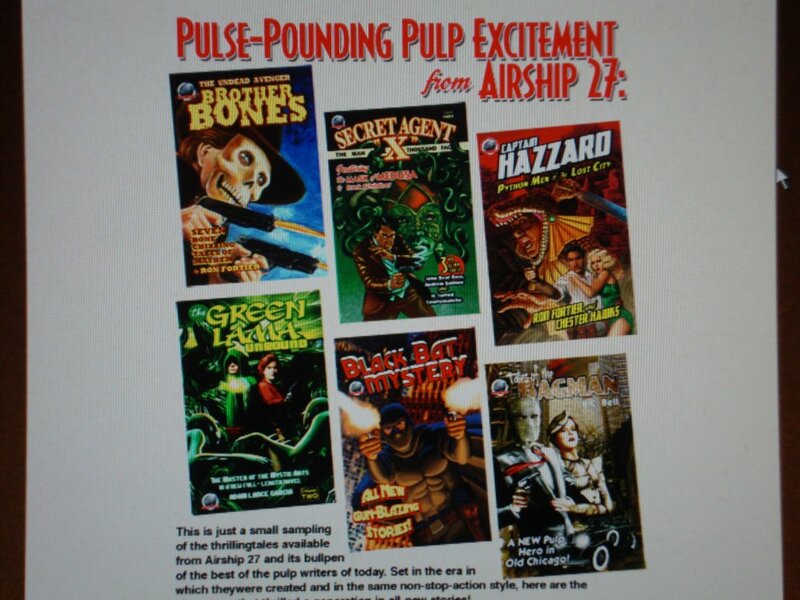 Look For More Airship 27 Titles Coming Soon to iPulp Fiction. 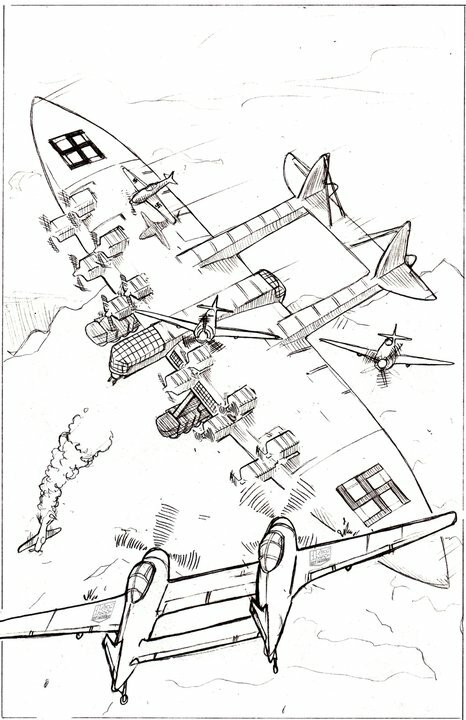 Airship 27 Productions editor Ron Fortier released artist Shannon Hall's cover pencils for the upcoming LANCE STAR: SKY RANGER Vol 3 today on the airship 27 Facebook Page. The cover now moves on to the painting stage. Keeping checking http://www.lance-star.com/ and this space for more on Lance Star: Sky Ranger Vol. 3. Bobby Nash joins the Earth Station One podcast as a regular crew member. Beginning with this week's episode 68, Bobby joins Mike F., Mike G., Dan, Judy, and the rest of the ESO crew as co-host. "I'm excited to be a part of the Earth Station One crew," Bobby said after the announcement was made on Sunday, July 10th. "This is a great group of people and I always have a good time chatting about all things geeky with them. This is going to be fun." Visit the Earth Station One Podcast Crew each week at http://www.esopodcast.com/. The Earth Station One Podcast is a podcast celebrating our love for all things Sci-Fi, Fantasy, Comics and much, much more. We never know what really what we will be talking about, but we know it will be entertaining, and hope you enjoy. It’s time to let your inner geek out to play. 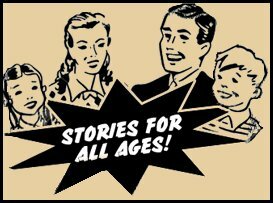 Join Mike Faber, Dan Rynn, Mike Gordon, Judy Faber and Bobby Nash as they dive headfirst into the world of their favorite topics, and see what we can find to get into trouble with! The Earth Station One Podcast, proudly serving you since April 2010. 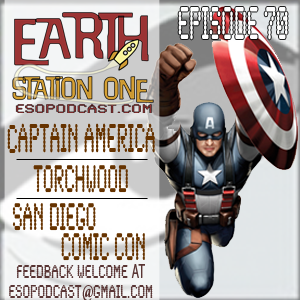 From the Darkest Corner of Cardiff... Earth Station One Talks Torchwood. Bobby joined the crew this week to record Episode 67 of the Earth Station One Podcast. 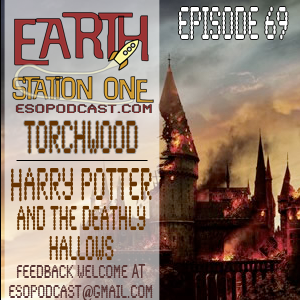 This fun-filled episode is packed with commentary, reviews, and conversation as the ESO Crew talks Vampires, X-Men First Class, the end of the space shuttle mission, Super 8, upcoming conventions, and this little show called Torchwood. 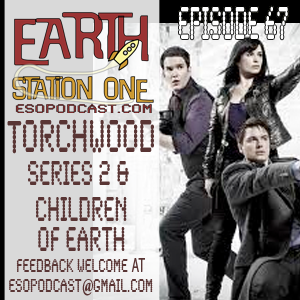 Join us for yet another episode of The Earth Station One Podcast we like to call: Coming To You from the Darkest Corner of Cardiff, we bring you Torchwood. Earth Station One episode 67 is now available at http://www.esopodcast.com/ or click the link above. 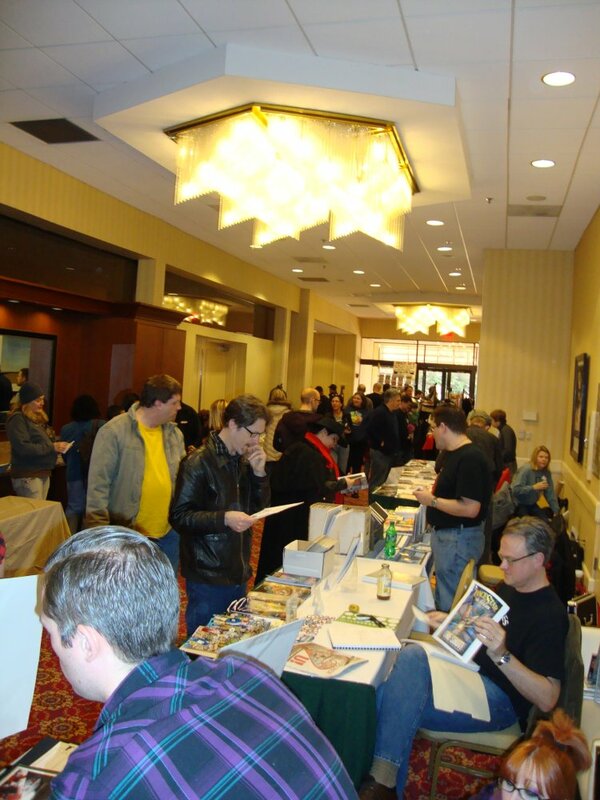 For those in the Atlanta area, the Atlanta Comic Convention one day show is tomorrow, July 10th at the Marriott Century Center in Atlanta (at I-85 and Clairmont Rd) from 11 a.m. - 5 p.m. The guest list includes writers (Bobby Nash [Hi! ], Sean Taylor, Mike Gordon, Greg Carter, and more), artists (Jason Flowers, James Burns, Lysa Shin, and more), actors, Walking Dead zombies, and even a wrestler. Plus the usual assortment of comic book and toy vendors selling their cool collectibles. You can learn all about it at http://www.atlantacomicconvention.com/ plus they have a Facebook page (there are links on my FB page, www.facebook.com/bobbyenash). 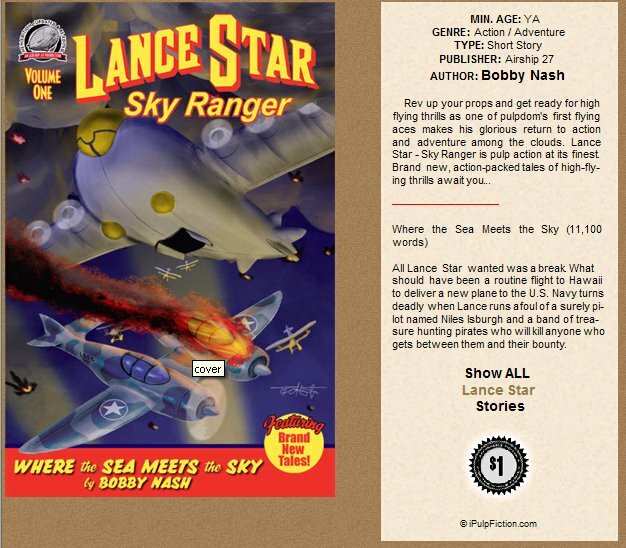 Lance Star: Sky Ranger "Where The Sea Meets The Sky" By Bobby Nash Is Now Available At iPulpFiction. Here’s the iPulp bulletin board. Bobby's first Lance Star: Sky Ranger story, "Where The Sea Meets The Sky" is now available at http://www.ipulpfiction.com/ for the low price of only $1.00. 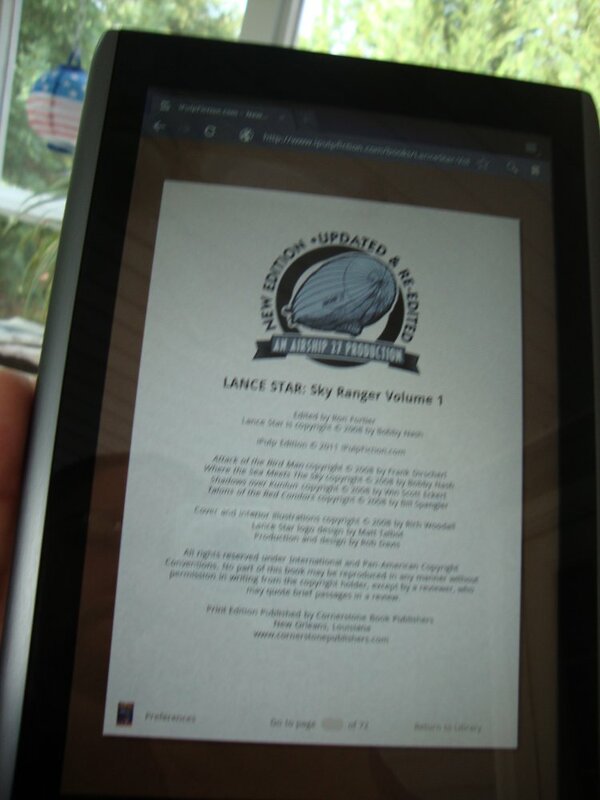 My Lance Star: Sky Ranger story, "Where The Sea Meets The Sky" will be available for mobile devices from iPulp Fiction tomorrow. Only $1. 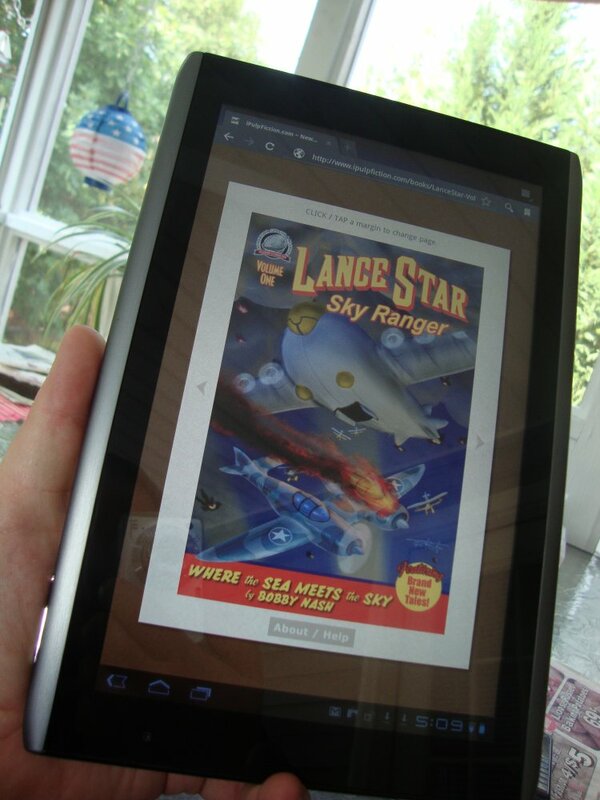 iPulp Fiction is releasing a story a day throughout June and July including tales featuring Lance Star: Sky Ranger. Bobby Nash’s story, “Where The Sea Meets The Sky” was released tomorrow, July 7th for the low price of $1.00. Visit iPulp at http://www.ipulpfiction.com/ for more information. 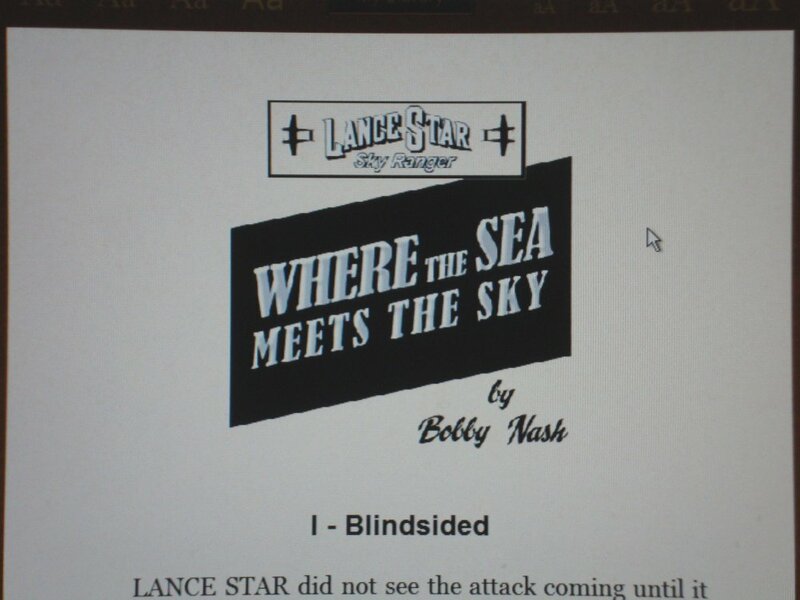 Make sure you check out Bobby Nash’s Lance Star: Sky Ranger story, “Where The Sea Meets The Sky” tomorrow for the low price of $1.00 at http://www.ipulpfiction.com/. Print and eBook digital editions from Airship 27 are also available. 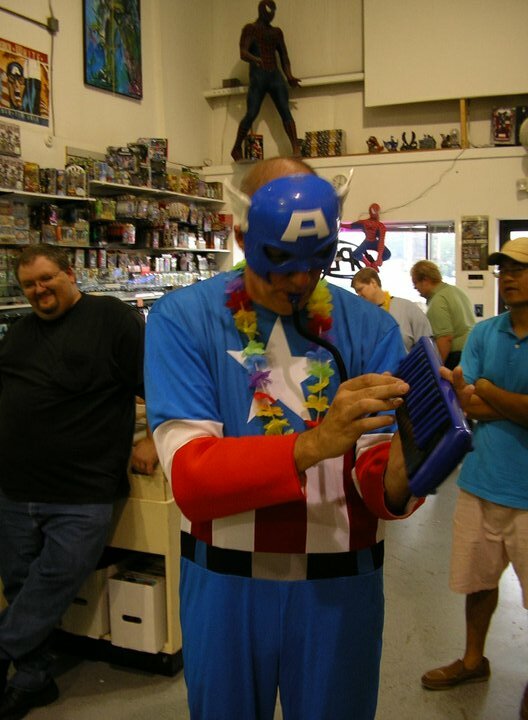 Meet Bobby At The Atlanta Comic Convention This Sunday. Meet Author Bobby Nash at the Atlanta Comic Convention on Sunday, July 10th in Atlanta, GA.
Bobby joins a jam-packed list of talented guests including writers, artists, actors from The Walking Dead, and wrestlers. 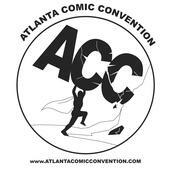 For more information on the Atlanta Comic Convention, visit them at http://www.atlantacomicconvention.com/. 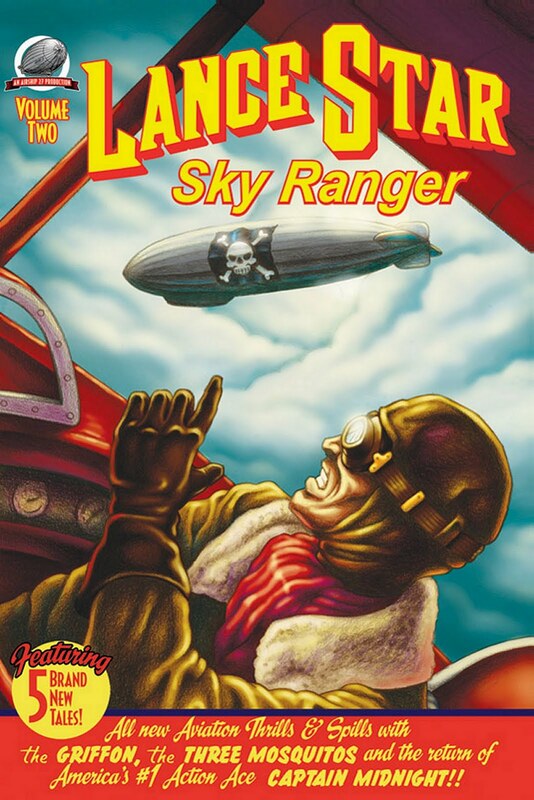 Lance Star: Sky Ranger pulp anthologies Vol. 1 & 2, Ravenwood - Stepson Of Mystery, and the rest of the Airship 27 catalog are still available in print and eBook editions directly from the publisher at http://www.gopulp.info/. Keep checking this space for more itunes releases as they develop.